Fair. 013460153X **PLEASE NOTE** This book has suffered some water marks that may cause staining or wavy pages, however it is a good, usable copy. Regardless of title, CD/DVD/Access Codes or Supplemental Materials are not guaranteed. This is a U.S. Student Edition Book. This book is not a rental. Very Good. Ship within 24hrs. Satisfaction 100% guaranteed. APO/FPO addresses supported. Trade paperback (US). Glued binding. 576 p. Contains: Illustrations. Fine. 013460153X PLEASE READ >> NEW softcover marked INSTRUCTOR'S REVIEW COPY not for sale. 8th Edition. Same content as student text. DAILY SHIPPING! New. 013460153X BRAND NEW W/FAST SHIPPING! 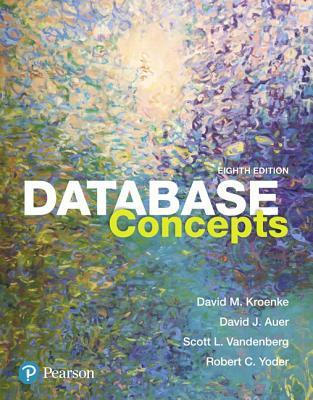 This item is: Database Concepts, 8th Ed., 2018, by Kroenke, David M. ^Auer, David J. ^Vandenberg, Scott L. ^Yoder, Robert C.; FORMAT: Paperback; ISBN: 9780134601533. Choose Expedited for fastest shipping! Our 98%+ rating proves our commitment! We cannot ship to PO Boxes/APO address. To avoid ordering the wrong item, please check your item's ISBN number! The book was used but of very good quality! WIth expedited shipping received it in 2 days!